Linear time-varying systems are encountered in many technical areas, for example as a means of modeling communication channels or signal processing blocks. Typically, this time-varying behavior is undesired as it has a negative impact on the performance of consecutive blocks in the signal processing chain. This negative impact can be reduced by either preprocessing or postprocessing the signal with a time-varying correction filter. Methods for the design of these filters are the focus of this work. The viability of a proposed filter design method is demonstrated by preprocessing the digital input signal of a digital-to-analog converter (DAC) which exhibits non-uniform sample-and-hold signals. 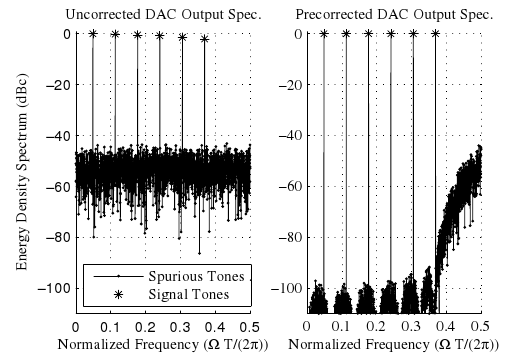 This non-uniform behavior is caused by sampling jitter and results in a floor of spurious tones reducing the spectral purity of the output signal of the DAC. Employing the proposed precorrection scheme, a considerable attenuation of the in-band spurious tones in the output spectrum can be observed, resulting in a signal-to-noise improvement of 59.9 dB.